The month of September started with two of our important Vaisnava festivals, Sri Krishna Janmastami and Srila Prabhupada’s Vyasa-puja ceremony. If you had the good fortune to be there, then you know how wonderful they both were, and that we wrote a short summary about them in the previous newsletter for those of you who were not able to attend. Two weeks later we were eagerly waiting for the devotees at the Radhastami festival! 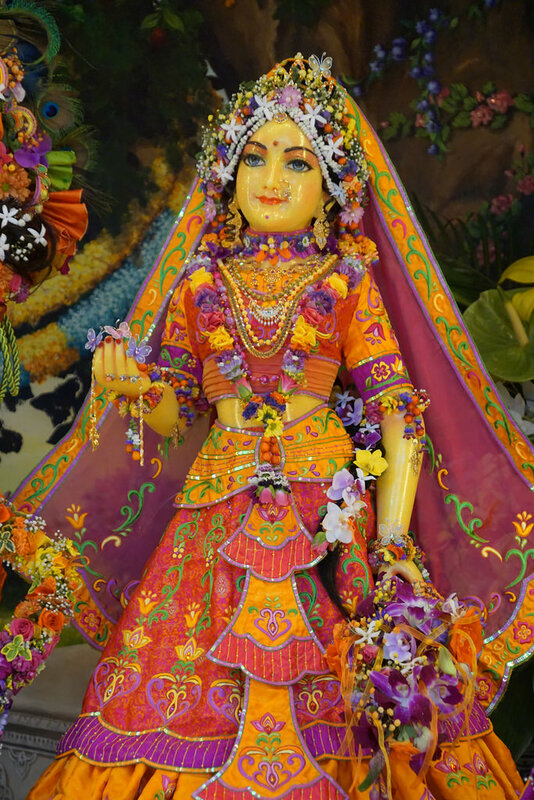 Radha-Syama received Their guests in Their new, richly embroidered outfit surrounded by a colorful flower kunja. 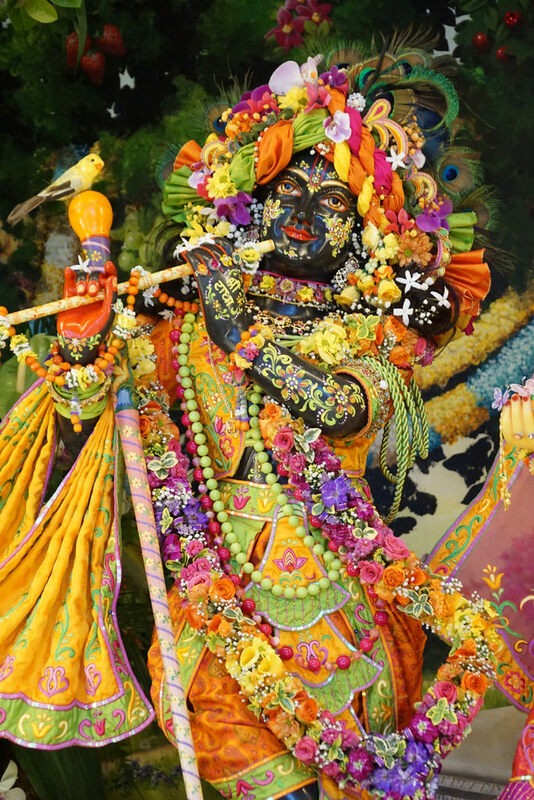 Many of you have asked about Srimati Radharani’s molten gold colour and how Her bodily hue was achieved. As we know from the sastras, Her complexion is beautifully colored in that way, so our answer to that question is that sometimes She mercifully allows us to see it – as She did on the day of Radhastami – and sometimes we are unable to see it due to our conditioned state. The program turned out to be different than was originally planned: the kirtana was led by His Holiness Sivarama Swami Maharaja and His Holiness Bhakti Bringa Govinda Swami Maharaja and it was so nectarian that it just couldn’t be stopped! So the lecture and the initiations were delayed with the abhishek being postponed to late afternoon. In the evening we continued with the happy chanting of the holy names for the pleasure of Radha-Syama… until 2 am next morning. 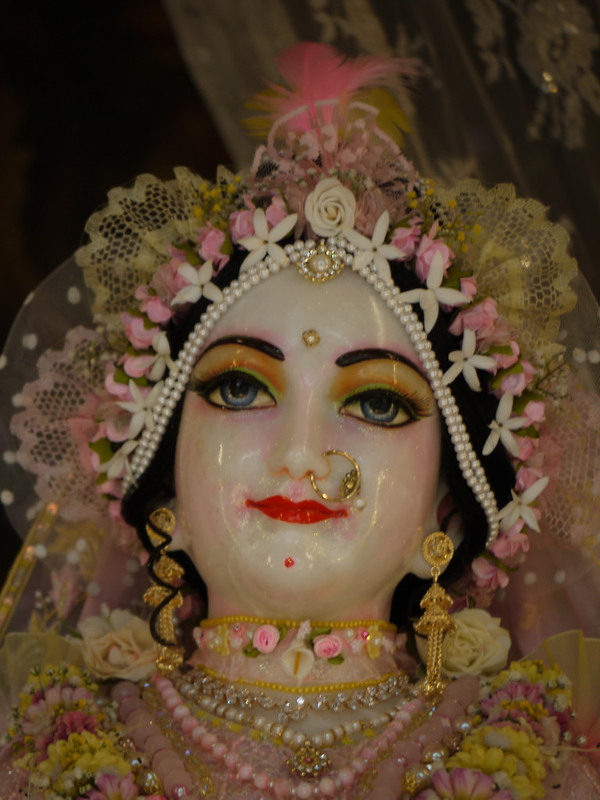 The actual appearance day of Srimati Radharani was on Monday, but we held the festival before that on the Saturday, giving more devotees the opportunity of attending. So two days after the big festival we held a smaller one! Sivarama Maharaja and Govinda Maharaja had planned a shorter kirtana stating: “Devotees are tired, so after a short kirtana we’ll just continue with bhajana.” But Radha-Syama had different plans and we merged into the nectar of the holy names again, meaning the kirtana which started at 7am lasted until 11am. 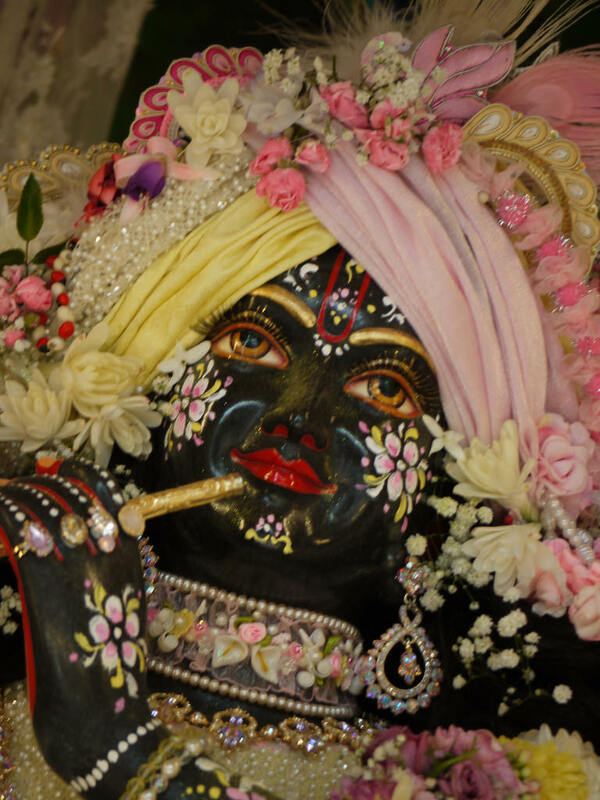 Adikarta Prabhu then gave a wonderful class about the 25 transcendental qualities of Srimati Radharani. After class we performed puspanjali for small Radha-Syama and then had the opportunity to taste the preparations the cooks had made for Them during the morning. Continuing on in the evening we started with bhajana… and although the devotees were tired, the transcendental bliss again induced them to dance, which soon turned again into an ecstatic kirtana! As we have written in the previous issue, many devotees offered Nitya-seva donations on the day of Janmastami for the pleasure of Syamasundara. 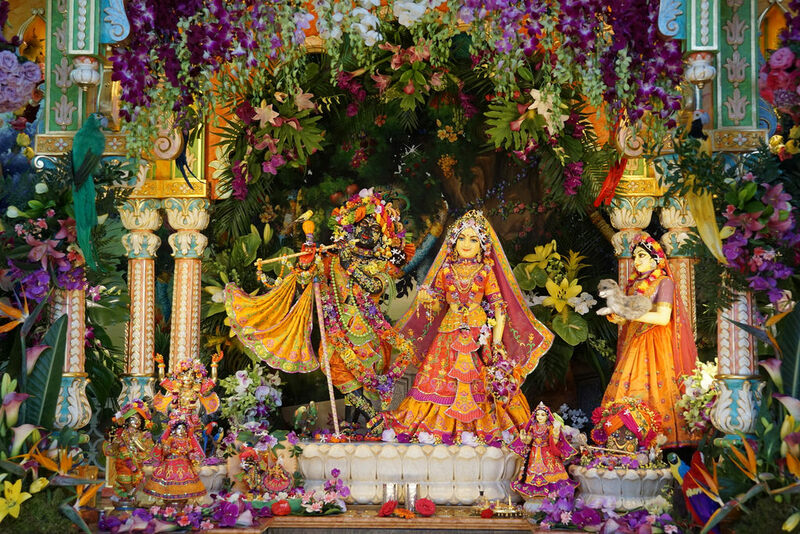 However it turned out Srimati Radharani received even more offerings! A couple - who previously promised a Nitya-seva sponsorship – had collected the laksmi for one whole year: they only spent what the husband earned while saving the wife’s salary until they had the full amount. 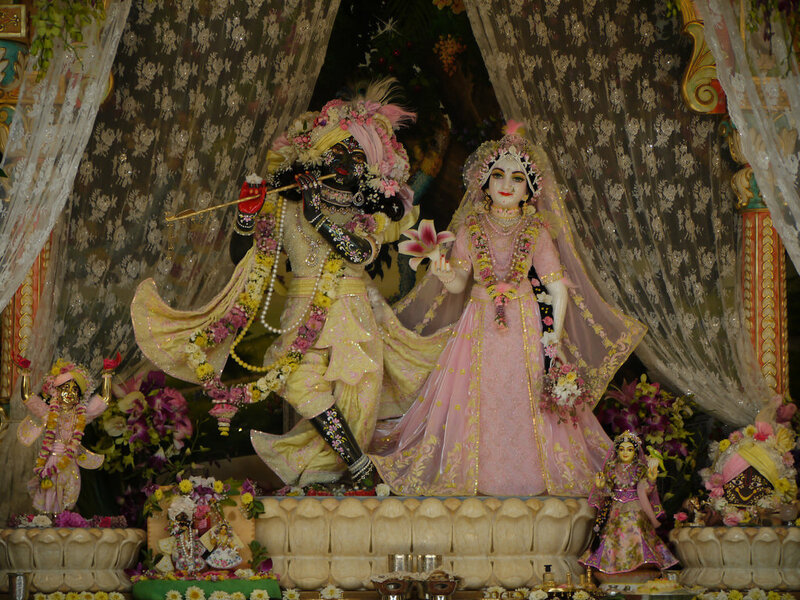 So they were able to happily offer that sum at the lotus feet of Radhe-Syama on Radhastami day. Four new donors started their payments and many of you again timed your installments for this special day. Besides these another family raised their Nitya-seva payment to a new amount and one family completed their sponsorship during September. In the name of Radha-Syamasundara and Dayal-Nitai Vijaya-Gauranga we would like to thank you all so much for your contributions! We only have one big festival left for this year: the celebration of Govardhana-puja will be held on the 10th of November here in Krishna Valley. We would like to invite all of you to come and please celebrate it with us! 4th, 5th, 6th, 9th, 12th, 13th, 14th, 15th, 16th, 17th, 18th, 21st, 22nd, 23rd, 26th, 27th and 30th.